The decision by the Obama administration to provide nonlethal aid to Syrian rebel forces seeking to overthrow President Bashar al-Assad is drawing fire from some in the aid community, saying it politicizes aid and violates principles of neutrality which governs aid delivery. Secretary of State John Kerry on Thursday announced the United States would give aid to armed opposition, including medical supplies and meals. The aid marks the first signs of direct and vocal American support for the rebels in the nearly two-year bloody conflict, which the UN estimates has claimed more than 70,000 lives and forced millions more from their homes. Washington hopes the aid will bolster the credibility of the Syrian opposition, peel away supporters from al-Assad and curb a growing allegiance to radical Islamic groups gaining favor among the population by providing basic services to citizens in rebel-controlled areas. But some aid workers worry al-Assad’s regime could punish all humanitarian groups for the U.S. decision, thus hampering efforts to deliver aid. The State Department is making a distinction between the direct aid to the Syrian opposition and some $385 million in humanitarian aid which is delivered through the United Nations and aid groups throughout the country. But Andrew Natsios, a former USAID administrator currently at the Bush School of Government and Foreign Policy at Texas A&M University, says because the aid to the military involves life-saving items like food and medical supplies, it jeopardizes the humanitarian groups. Aid efforts, he said, must remain neutral in order for groups to access needy populations in areas held by both sides in the conflict and receive safe passage through war-torn areas. Groups seen as favoring one side over the other may be viewed with suspicion and lose their access to those in need or expelled from the country. In addition to the food and medical supplies for the rebels, the aid package announced by Kerry on Thursday also included $60 million to local groups working with the Syrian Opposition Coalition to form a government-in-exile and deliver basic services to Syrians in rebel-held areas. While the political aid for the opposition does not include items that are need-based, such as food or water, some aid experts say the whole package blurs the lines and warns Syrian forces, which have targeted bread lines and clearly marked humanitarian envoys. 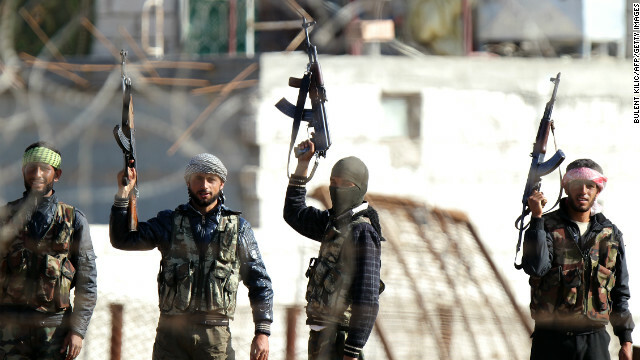 They could start targeting all aid workers in an effort to stop supplies going to the rebels. One official, who spoke on the condition of anonymity to protect aid workers on the ground, says his organization makes a concerted effort to distinguish between the $385 million the United States has earmarked for humanitarian aid, to be delivered through the United Nations, and direct funding for the Syrian opposition. What’s more, Abrams argues, the United States could help strengthen the opposition by helping them deliver aid to rebel-held areas. Michel Gabaudan, president of Refugees International, an advocacy organization that works to help refugees in conflict-ridden areas, argues Washington’s effort to help the opposition supply populations with basic services could underscore the principle of neutrality. US has a short memory and doing same thing again and again, expecting different result. This is a business decision. Saudi petro-dollar buys guns, Us feeds Islamist Jihadi and sends medicine, in case they get hurt. whats all of this pointless talk china should just nuke usa, britain, ireland, australia and ghana. just a-bomb all there irish asses bak to the jurassic age. then when they retaliate shot down all there minutman 3 icbms with your anti ballistic missile system. make these worm of humans pay a big prize for what they have said. sixty mil in Syria, and few hundred mills for rebels in Egypt, North Korea, Iran, Afghanistan, Pakistan, while we f***ing let go illegals. Obama you should be impeached. Although I do agree with your post above, George Patton in bad Mood today, do cut out the nasty Tea Party lingo as it has no place here. Obama should not only be impeached but also charged with crimes against humanity for ordering the butchery of people in Afghanistan, Pakistan and Yemen with those ungodly drones of his, hurling 500 lb. bombs on them! stupids are just going to throw away millions and millions down the drain; someone is going to get really really rich in Syria and here in the US. in 60 millions, you can rebuilt whole Damascus did you know that? Obama is glad to help out armed Islamofascist Rebels while at the same time trying to destroy his political rivals here in the US and disarm honest gun owners. We are now in forced spending cuts which will cause thousands to lose their jobs but we have money to send to Syrian rebels? Makes sense to me! Pass the porcupine I have a nosebleed, anyone up for a game of hemorrhoids? "........... and if we don’t do it, people are just going to suffer unnecessarily.” Hmmm.... sounds like a good argument for solving the budget crisis here. Oh, I have an idea! Lets send more money to help other people f*** the people of this country. The way I see it, the small group of rebels is destroying their country. Just curious how we can aid foreign fighters when we are about to chop 10's of thousands of employees due to the sequester? Foreign aid before home concerns? Because authorizing aid bypass's that useless piece of crap congress we're saddled with. That's an easy one – it isn't really aid as much as an investment, is it? Stoke the embers until you start a rebellion, topple existing governments, install a puppet regime, milk them for everything they've got until they tire of you – and then start over again. Story sound familiar? How you ask?They will just take part of the money they cut and use it!! Isnt it nice to know that we have a country that will watch its own people suffer yet give billions and billions and more in aide to countries that would completley destroy this country and stab us in the back first chance they get. It appears that way, Walter A. This always happens when we elect those idiotic right-wing politicians into office. Enough is enough! Well Patrick, honestly, I'm looking at it from Canada (Windsor Ontario) across from Detroit. It just boggles my mind how a country can give away money when they are Trillions in debt, a city like Detroit ready to collapse and many people without work. Toss more out on the street. My homeland isn't much smarter. My concern is my daughters are all US citizens and one works in law enforcement and the other is stationed in Afghanistan with the Marines, thus my interest. Time to let the Non North American countries fend for themselves for once. Cheers.